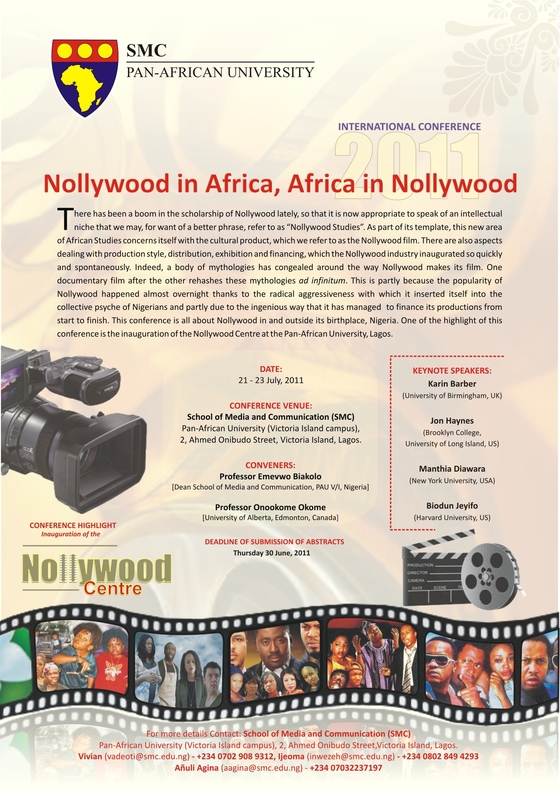 There has been a boom in the scholarship of Nollywood lately, so that it is now appropriate to speak of an intellectual niche that we may, for want of a better phrase, refer to as “Nollywood Studies.” As part of its template, this area of African Studies is concerned with the cultural product, the Nollywood film. There are also aspects dealing with production style, distribution, exhibition and financing, which the Nollywood industry inaugurated so quickly and spontaneously. Indeed, a body of mythologies has congealed around the way Nollywood makes its film. One documentary film after the other rehashes these mythologies ad infinitum. One remarkable feature of Nollywood as African’s “dream factory” is that it came into life and has lived its life without the express support of any Government or other institutional means. However, understanding the popularity that Nollywood enjoys across the African continent and its diasporas is a complex matter. Nollywood was able to achieve and sustain this popularity because it has managed to find new ways of migrating in and outside Africa without let or hindrance. Yet, its growth and unprecedented popularity as Africa’s “popular cinema” did not happen without peculiar challenges for the producers. In the early days, Nollywood was vilified in the as the art of idiots and some even vented to called it the “peddler’s art” in the same way that Hollywood was vilified in the 1890s. Even today, not everyone is happy about what it reads as local cultures. Many still regard it as “fake art.” Some still describe it as “infantile” in the ways it reads, makes and circulates culture. Inattentive to what the cultural brouhaha is all about, Nollywood producers have gone on to do what they know how to do best: produce more Nollywood films for their captive audiences across African and in the black diasporas. This conference has two goals. First, it seeks to rephrase the significance of Nollywood as a popular vehicle for the production of culture and the provision of a systematic way of reading the Nollywood film (and industry) as popular art. To answer these questions, the convener solicits abstracts that deal with: (1) the production and circulation of culture in Nollywood; (2) Nollywood in Africa and the African diasporas, (3) Nollywood’s Africa and the representations of Africa in Nollywood;(4) the audience of Nollywood; (5) women in/of Nollywood; (6) transgressive and un-cultural Nollywood; (7)sexualities and sexual preference in Nollywood film; (7) exhibition, financing and distribution in Nollywood; (8) the internet and Nollywood; (9) Nollywood and the development of national cinemas in Africa;(10) and Nollywood in the world. Invited speakers include Professor Karin Barber (University of Birmingham, UK), Professor John Haynes (Brooklyn College, Long Island University, New York), Professor John McCall (University of Southern Illinois, US) and Prof. Dr. Till Forster (University of Basel, Switzerland). Abstracts and inquiries should be sent by email to Añuli Agina <aagina@smc.edu.ng>, Vivian Ojiyovwi-Adeoti <vadeoti@smc.edu.ng>, and Ijeoma Nwezeh <inwezeh@smc.edu.ng> no latter than June 30, 2011 and clearly marked, “Nollywood in Africa Conference” on the subject line of the email.